Two and a half hours and three bars later, Phil and I were finally calling each other by name, although as far as conversation was concerned, we seemed to be repeating Sally Field’s Oscar speech a lot. Ramona Bistler went home. By herself. “What a washout,” I grumbled as Phil parked the BMW across the street and down a little, where it wouldn’t be obvious but there was still a good view. “Tonight has not been a total loss,” he chuckled. “I doubt it.” Phil yawned. He had sent his friends on home. He stretched, then let his arm fall across my shoulders. He moved in. I went to meet him. “What’s that?” I yelped, pulling back at the last second. A lone figure ran across Bistler’s lawn. “I’ll go find out,” said Phil. Nervously, I picked up my phone and dialed. It took about three minutes to get through everything. It might have taken less time, but I got tongue-tied when I told the operator my friend was trying to get a better look at the intruder, and she asked for his name. She didn’t notice a thing. I even had to spell it for her. Phil had yet to show up. I got worried and left the car. A tall, spare figure came around the corner of the house. Lamplight glinted on his light hair. He didn’t look quite right. I figured it was the dark. The figure ran back where he’d come from. I chased after him. Just as I got to the corner of the house, I was grabbed. I screamed. A hand clamped over my mouth, cutting it short. “He went that-a way!” I pointed. I started around the corner, but Phil held me back again. I followed Phil to the other edge of the house. Phil made me wait at the corner. A minute later I heard several thuds, shoes scraping across stucco, and a couple ominous oophs. I started back, but was pushed aside by a running figure. I ran after. I hadn’t grown up playing football for nothing. I tackled the man at the end of the driveway. I made one fatal error. Once I had him down, I had no idea what to do with him. He heaved up. I fought for my grasp and hung on. He rolled over on top of me. I gasped as he sat up on my mid-section. He swore as he saw my legs. He knew I wasn’t very heavy, but I guess didn’t expect to find I was a woman. I pounded on his back. He jumped to his feet, and was blinded by a bright white light. I was so glad when he didn’t make a run for it. I waited until the officers had Lansky in their grasp before stirring. It startled the hell out of one young man about my age. “You alright, lady?” he asked, as I got up. “Yeah. Fine. Oh no! My friend!” I ran to the side of the house. Phil slowly made his way out. “Are you alright?” I asked, and slid under his arm. Another patrol car pulled up, and two more officers fell out and prowled around the grounds. A female voice shrilled out, cursing in all manner of foul language. An infuriated Ramona Bistler appeared in a skimpy negligee from her front door. “I demand to know what is going on here!” she shrieked. Bistler shivered. Well, it was cold and she wasn’t wearing that much. The young officer presented her with a grey woolly affair. Bistler snatched it and wrapped it around herself. “I just drive him nuts,” I said with a little grin. Bistler was too nervous to notice. She kept looking at the house. A few minutes later, the officers said it was all clear, but they wanted to have a lab team and detectives look at the forced window. 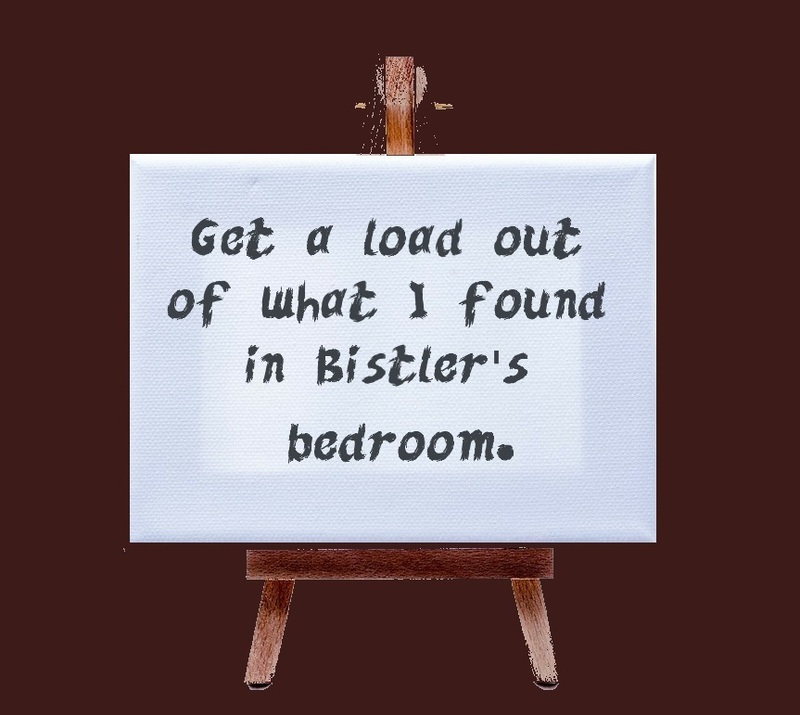 Bistler sighed with relief. Phil and I followed her inside as if we belonged there. Officers went back and forth between the front door and Bistler’s bedroom. I walked back and peeked in. By that time, the detectives had arrived with the lab truck. One man dusted for fingerprints, while another photographed the outside. I walked all the way into the room. The bed was a mess, with one set of pillows on it, pushed to the left. On the right hand nightstand was a small brass lamp, pushed to the back of the table. It’s shade had been knocked askew. Under the lamp were two dimes. On the floor, next to the stand, a brass card case lay up-ended in a v-shape. Several white business card were scattered under the case, and three pennies and a nickel lay close by. I bent down to look at the cards. I slid the card out carefully. Even if the officer was more interested in people getting in, I was interested in the man who had gotten out. I read the name on the card, and smiled. Phil and I called Mrs. Sperling from his iPhone. It was only twelve fifteen, and she was still up. We went by the house and brought her and Eleanor to the police station. She had called Sergeant Michaelson, and he was there waiting for us, yawning and wearing a beat up velour sweat top and jeans with a bagging seat. “You think this Lansky guy’s important?” Michaelson asked as we walked in. Phil looked at me, and I shrugged. I had missed that call. Michaelson yawned, and led us down to the questioning rooms. He looked at the detective standing at the door. In a most eloquent shrug, the detective said odds were fifty-fifty that Lansky would talk. We went in. I don’t know if it was exactly legal. I’m pretty sure Mrs. Sperling wouldn’t have risked messing up the court case. Lansky sat huddled in a chair. “She’s not fooling, Lansky.” Michaelson added the official voice. “What were you breaking into your former boss’s house for?” asked Michaelson. “Do you know Kyle Hoffman?” asked Michaelson. “Answer the question, Lansky,” growled Michaelson. “What do you know about rumors that he was counterfeiting?” asked Mrs. Sperling. Officer Willoughby appeared from another questioning room. “Good evening, Officer,” Mrs. Sperling smiled pleasantly. “Well, I’ve got to get back to my beat,” said Willoughby, and left. Michaelson yawned again and nodded. He went his way, and we went ours. “Was the capture of Mr. Lansky the total profit of your evening?” Mrs. Sperling asked Phil and me as we walked through the halls. Phil burst into loud laughter. I shushed him, then told Mrs. Sperling about the bed and nightstand. Phil wasn’t listening, nor was I. Our eyes caught, and while it was not the most romantic moment, it was the right one. We kissed. Phil grinned, and brushed my nose with his finger. “Just a modicum,” he said.